From 100 Bible Verses That Changed the World, by William J. Peterson and Randy Petersen, published by Fleming H. Revell, 2001, pages 59-60. The greatest Dutch master of the seventeenth century and one of the greatest artists of all time was Rembrandt van Rijn (1606-1669). Known for his portraits, he also loved to paint biblical characters involved with emotional situations. Two of his early paintings were The Martyrdom of St. Stephen and Pilate Washing His Hands. But his biographers describe him as a proud, vain man in his young life. An early painting shows him drunk in a brothel, with sexually greedy eyes. 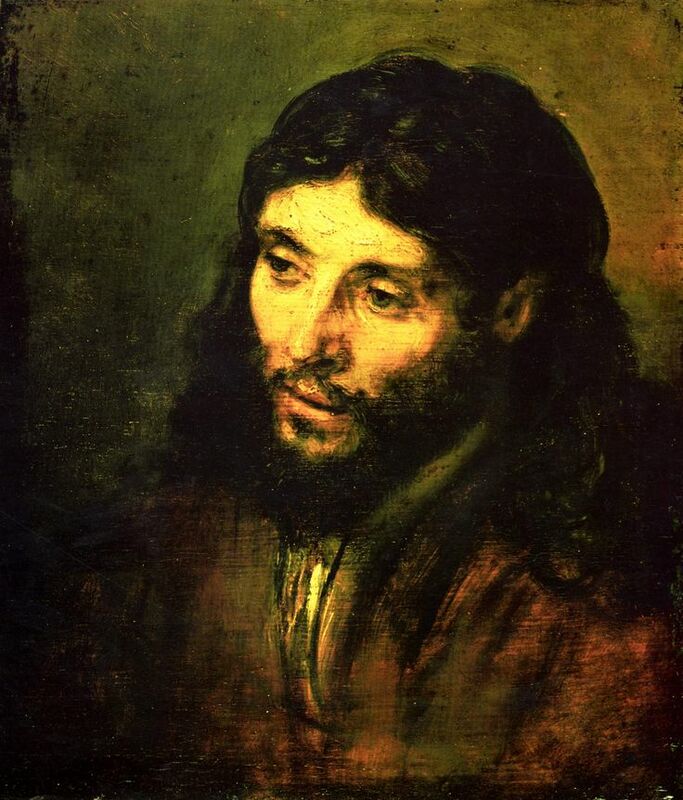 Like the prodigal son, Rembrandt sought money and fame, trying to impress the rich and famous. His paintings were filled with extravagant costumes and apparently his wardrobe was too. Then misfortunes struck, one after another. Both of his parents died before Rembrandt was thirty-five, and three of his children died in infancy. The most painful blow came when he was at the peak of his fame in 1642. Shortly after his son Titus was born, his beloved wife, Saskia, died from complications in childbirth. Criticism from the church caused him to give up religion. His friends deserted him, and an economic recession dried up the market for his paintings. To pay bills and avoid bankruptcy, he eventually auctioned off many of his works for a ridiculously small sum. 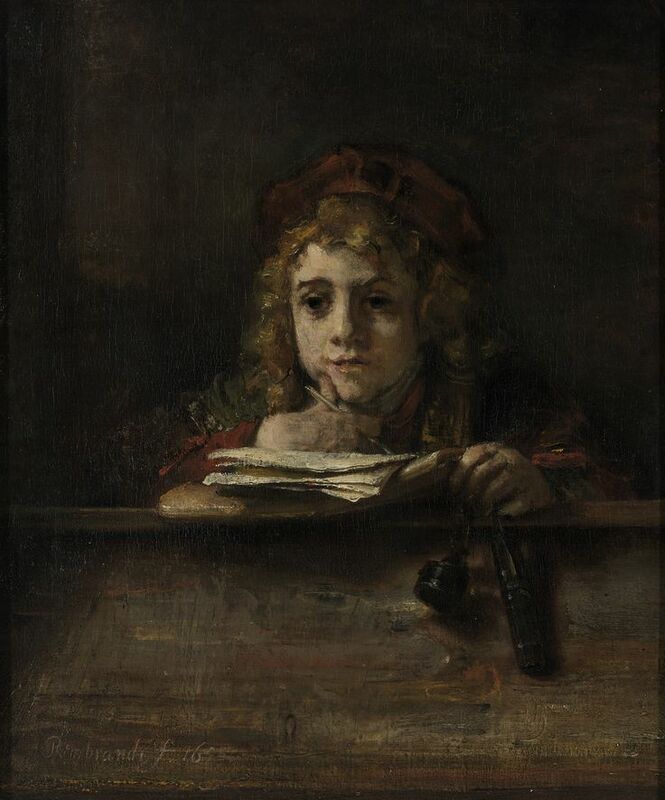 Rembrandt’s only hope and joy was his son, Titus. With pride he watched the boy grow into manhood. His paintings from that era include Portrait of Titus Reading, Portrait of Titus in a Hat, and Portrait of Titus Dressed as a Monk. One of Rembrandt’s biblical paintings at this time was Jacob Blessing the Sons of Joseph; undoubtedly it was his prayer that Titus would have children that he could bless. When Titus married and had a daughter, Titia, joy came again to Rembrandt, joy that he had not experienced since before his wife had died. But then tragedy struck again when Titus unexpectedly died. Rembrandt went into depression, living on bread and cheese and rarely leaving his home. His isolation was finally broken when he received word that Titia was going to be baptized. He attended with tears flowing down his cheeks. 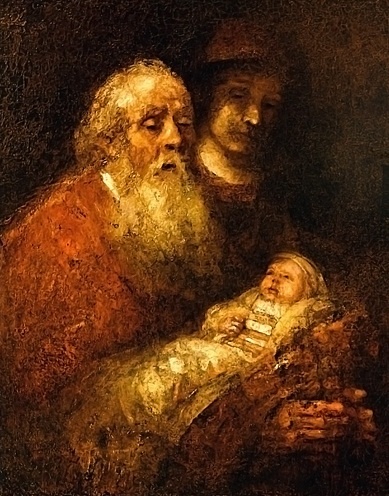 The emotional scene is reflected in one of Rembrandt’s last paintings, Simeon with the Christ Child in the Temple (1669). As you view the painting, you can almost hear Simeon (and Rembrandt) saying the words, “Lord, now You are letting Your servant depart in peace” (Luke 2:29) as he held the child in his arms. But how could Rembrandt express all the emotions that swirled within? What Bible story would do it best? The artist turned to the parable of the prodigal son, a story that had always been a favorite of his. 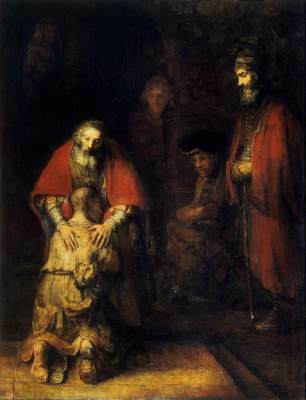 The Return of the Prodigal Son (1669) reflects the complex emotion that swirled in Rembrandt’s life. You see him as a father who wished he could embrace his son, Titus, one more time. But you also see Rembrandt himself as the humbled prodigal at the end of his life, now longing for the warm embrace of his heavenly Father. He had been stripped of everything, and now all that was left was the sublime simplicity of his Father’s love. Without question, Rembrandt’s realism changed the art world. But even apart from the world of art his influence was profound. Because he found in Christ’s life and parables the subject matter that stirred his emotions, he was able to put on canvas a unique dimension of scriptural truth for all the world to experience. Luke 2:29 (KJV) — Lord, now lettest thou thy servant depart in peace, according to thy word. Psalm 40:1-3a — I waited patiently for the Lord; he turned to me and heard my cry. He lifted me out of the slimy pit, out of the mud and mire; he set my feet on a rock and gave me a firm place to stand. He put a new song in my mouth, a hymn of praise to our God.